Advances in BMCS capabilities are now enabling these separate systems to integrate critical system information into one common protocol displayed at one operator workstation. Today's mission critical businesses all have one common objective, 100% uptime 24 hours a day 7 days a week. A prime example of such a mission critical application is the modern data center facility. In order to support this objective of 24 x 7 availability data center mechanical and electrical system designs utilize fault tolerant principles and system redundancy. The frequently overlooked system in today's data centers is the Building Monitoring and Controls System (BMCS). Traditionally data center BMCS systems have NO redundancy and utilize NO fault tolerant design. In addition present day data centers have evolved into a complex mesh of network equipment, mechanical and electrical systems, building controls and site security and access. These multiple systems are required to interact and work 100% in sync at all times. While these systems are specified to operate simultaneously they characteristically have no common platform for communicating status information or responding to critical system failures. In lieu of a common communications platform these systems are typically monitored and alarmed using proprietary communications platforms displayed at separate operator workstations. Advances in BMCS capabilities are now enabling these separate systems to integrate critical system information into one common protocol displayed at one operator workstation. BMCS systems have advanced to incorporate full building integration and control. Conventional building control systems (Fig. 1) are classified as Direct Digital Control (DDC) systems that are utilized to control HVAC equipment and monitor/alarm the buildings environmental conditions. The inherent difference in a BMCS system is that it enhances the abilities of a DDC system to incorporate a whole building approach to monitoring and control. A properly designed and specified BMCS system integrates information from all building components into one common system. The integrated information can then be utilized by the BMCS to control HVAC systems in response to building events and provide an integrated means of troubleshooting for facility management personnel during times of failure. The Implementation of an advanced BMCS system (Fig. 2) incorporating fault tolerant design, system redundancy, and system integration in data center infrastructure is critical to maintaining the goal of 100% uptime. Fault tolerant encompasses designing the BMCS system to fail critical systems "On" in the event of a control system malfunction. Fault tolerant design ensures that the systems cooling capabilities are not lost because the BMCS malfunctioned or lost power and shut essential mechanical equipment down. System redundancy ensures that the BMCS will not be immobilized by a single component failure. System redundancy includes redundant Ethernet backbones, self healing communication busses, and separation of mechanical and electrical BMCS monitoring and control components. System integration is the incorporation of separate systems into one control scheme. The sophisticated BMCS when implemented correctly can assimilate separate systems into one integrated solution. A brief list of systems that can be integrated into the BMCS include computer room air conditioning/handling units, chilled water plants, UPS systems, battery monitoring systems, standby generators, power monitoring systems, electrical switchgear, DDC systems, lighting, and security systems. Interaction of separate systems facilitates rapid system response to critical events; these events if unnoticed will impact the business mission. Facilities management personnel have one central operator workstation used to monitor, control, and alarm for all systems integrated into the BMCS. Systems that were previously not monitored and alarmed by a remote system are now integrated into the BMCS. Potential problems can be identified and diagnosed prior to equipment malfunction or failure. The end result is enhanced systems reliability. Cost savings can be realized when the troubleshooting of a system failure no longer requires extensive inspection and testing of multiple systems. Alarms for all monitored systems are accessible via the Internet, modem, page outs, or emails. Reaction and response times are quicker with this valuable feature in place. Fault tolerant design ensures that no single failure affects business operations. 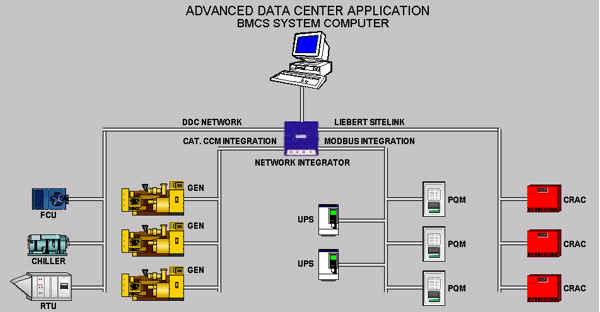 Without a properly installed BMCS system critical system information is only accessible locally at the equipment or through vendor supplied computers. The interaction of all systems is essential for reliable operation and control. When designing for a mission critical application as in a data center business it is important to specify a first rate BMCS to ensure proper building monitoring, alarming, and control. Travis Short is the Lead Controls System Engineer for SYS-TEK Companies USA, Inc. a small business that is dedicated to the design, installation, commissioning, and maintenance of critical 7x24 Facilities. SYS-TEK Companies USA, Inc. is located in Blue Springs, MO and on the web at www.sys-tek.com. SYS-TEK offers Mission Critical Facilities a single source approach to the design and installation process. SYS-TEK provides MEP Engineering, Site Acceptance and Systems Integration Commissioning, BMCS Design and Installation, Facilities Management, and Design Build Services.